There is a genre of literature in which the work is purposely written within the diary format; this type of writings known as diary fiction. Diary novels traditionally reflect what the authors think real diaries are or are written as a parody of the diary as a negative model. The authors of diary novels choose the diary form because its artistic quality expresses a greater sense of immediacy to the reader than other forms of literature. The diary novel emphasizes the time of writing rather than the time that it is written about, so the diarist usually writes about events of the immediate past - events that occur between one entry and the next - or records his momentary ideas, reflections, or emotions. Turgenev's "Diary of a Superfluous Man" represents the marriage of a memoir and a diary, resulting in a work with more contemporaneous content than recounting of memories: a diary novel. 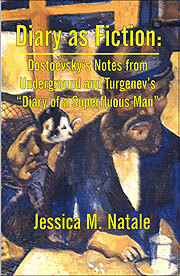 Dostoevsky's Notes from Underground presents an interesting variation of the diary novel, which is devoid of any dated entries. Instead, it is divided into two parts. In the first part the narrator describes his present life and philosophical ideas. In the second half, he recounts the past. Therefore, like Turgenev's work, Notes from Underground combines aspects of the memoir and diary novel genre, but the overriding existence of real or present time writing, supports the sole diary novel classification.